It is with great sorrow that we have received the sad news of passing of the Maestro, Mr. Viktor Fedotov. Mr. Fedotov, the oldest conductor of the Mariinsky Theatre passed away on 4th of December in Saint-Petersburg. He was working active on international fields of ballet, which include the Mariinsky Theatre, a number of others throughout Russia and western countries, as well as the Royal Ballet. Since our Theatre's opening in 1997, he has conducted for our performances, such as "The Sleeping Beauty", "Swan Lake", "The Nutcracker", "Giselle" and "Don Quixote", always leading our ballet company to accomplish the higher level of performances. Here we extend our deepest condolences to his family and associates. Due to the sudden passing of Mr. Fedotov, Mr. Alexandr Sotnikov of Bolshoi Theatre will conduct for our February programme "Swan Lake". For Friday 8, a part of seats on both 1st floor and 2nd floor is reserved for a group of students. For Saturday 9, the number of seats available is becoming short, as several groups have reserved for the date. Available from Sunday 18 November, 2001 at 10:00 am. A swan, which has descended on a lake, is transformed into a beautiful and noble lady with the coming of night. Through its pure and chaste image, Swan Lake symbolically depicts the love and death of human beings. Tchaikovsky's dramatic music combines with Petipa-Ivanov's masterful choreography which brings together the essence of classical ballet technique to create an immortal work that is so popular throughout the world that it has become a synonym for ballet art. 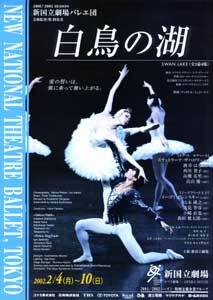 Swan Lake premiered at the New National Theatre, Tokyo in 1998 using the Sergeyev version, the standard and established one which has retained the quintessence of the original choreography to the present day. Since then, the ballet has been performed every season and its beautiful performances, which are filled with dramatic elements, are always accorded a favorable reception. Every time Swan Lake is presented, it is imbued with fresh and new sensibilities, producing a great impression on the audience. Another topic of conversation for the forthcoming production is the fresh cast of dancers from the New National Theatre Ballet, as well as guest dancers who have a thorough knowledge of the Sergeyev version from the Mariinsky Theatre Ballet. Prince Siegfried, who has attained manhood, meets Princess Odette by the lake and falls in love with her. Odette is turned into a swan by the magician Rothbart and can only be restored to human form during the night. Told that only true love will break the spell, the Prince vows to rescue her. At a ball held on the following day dazzled by Rothbart's trickery Siegfried pledges his eternal love for Rothbart's daughter Odile, who is also in attendance. The magician triumphantly laughs at Siegfried and Odette, who have no choice but to wait for ruin. The Prince puts forth his last strength to face their terrible fate.